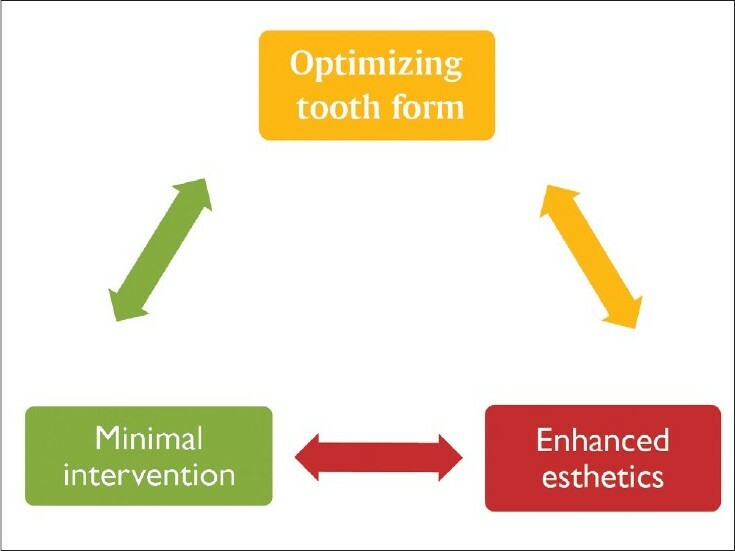 0Optimizing tooth form has always been the ''Holy Grail'' of operative dentistry. Recreating the missing tooth anatomy is important to not only replace lost structure but also to re-establish ideal form and function. Until recently, this was achieved with traditional materials such as cast gold or amalgam. They provided durable restorations with excellent contacts and contours which lasted for several decades. However, since they were nonadhesive, they required mechanistic cavity preparations with macro retentive features and the results could hardly be called esthetic. This paper reviews the evolution of techniques and recent developments in achieving predictable contacts with posterior composites. The proximal contact or "contact area" refers to the surface area where the proximal faces of neighboring teeth come in contact. Initially, when teeth erupt and meet each other at a point, it is known as a "point contact." With time, due to proximal attrition, this becomes a "contact area." The contact area is usually located in the upper middle 1/3rd of the crown of most teeth, providing natural embrasures and an opportunity for good maintenance of the interproximal area. Improper restoration of contact areas causes displacement of the teeth, lifting forces on the teeth, rotation of teeth, deflective occlusal contacts and food impaction. This leads to trauma to the periodontium resulting in pain, inflammation and bleeding. 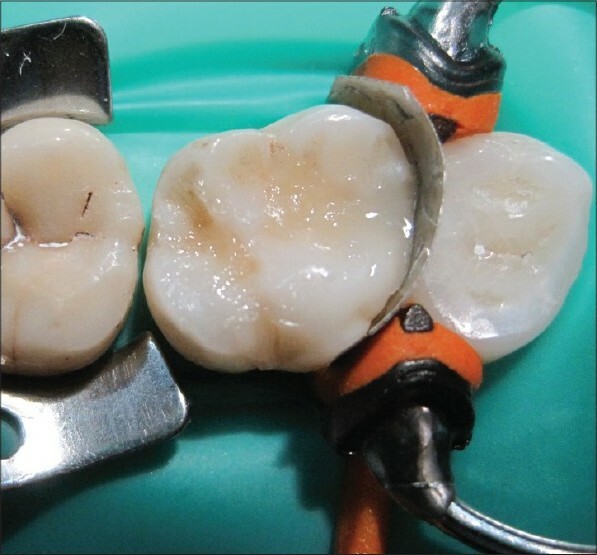 Can composites replace amalgam as the material of choice for Class II situations? Predictability and ease of establishing contacts. It is difficult to directly compare the longevity of direct restorations for various reasons. This may be due to variables in study design, differences in clinical procedures and materials used and variations in study characteristics. Longitudinal studies on posterior composite restorations over a period of 8 years or more reveal an annual failure rate of 1%--6% compared to 0%--7% for amalgam. 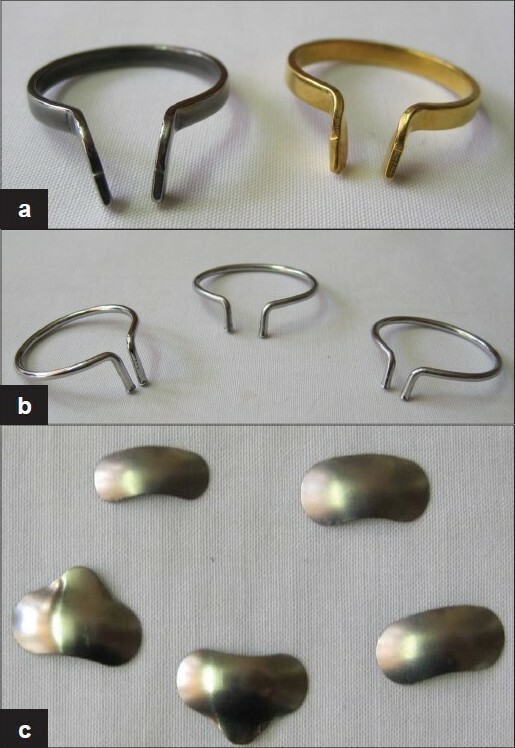 , Opdam et al, concluded that when operators who are skilled in both amalgam and composite techniques placed restorations, the annual failure rates of both materials were comparable. This includes the occlusogingival and the buccolingual contour of the restoration on the proximal aspect. This should be adequate to maintain contact with the adjacent tooth, not overly convex, concave, or flat. Recreation of the contact area in its ideal location will help to develop ideal embrasure form, thereby preserving the health of the gingival col and enabling food deflection during mastication. It is usually located in the upper middle third of the crown of most teeth on both proximal ends of the tooth equator and beneath the marginal ridges. Once the restoration is in place, the contacting teeth must be in close approximation. The contact must be neither open nor too tight. This can be checked by using dental floss. This is very important for long-term success as microleakage at this critical site is a leading cause for secondary caries. 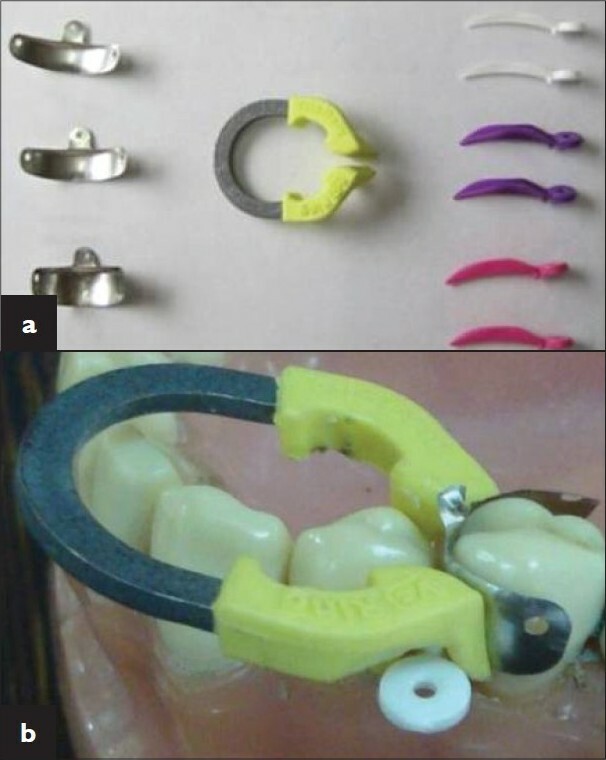 Circumferential bands created a flat interproximal contour. During band tightening they also tended to flatten out buccolingually resulting in open contacts. These are special instruments designed to create good contacts with posterior composites. They push the matrix toward the contact area during light curing. Figure 2: (a) Optra contact– contact-forming instrument. Light tip fi tted over light wand. Prefabricated ceramic inserts like Beta Quartz (Lee Pharmaceuticals Co., California), Cerana (Nordiska) etc., are formed from a silica-based glass composite which when heated crystallize to form a ceramic. These inserts are available in various sizes with size-matched diamond abrasives for the cavity preparation [Figure 2]b. The insert is treated with a silane-coupling agent to improve the bonding with composite. Use of these inserts displaces most of the composite from the volume of the restoration thereby improving the properties of the restoration. They created unnatural proximal contour. It was difficult to optimize the occlusal anatomy. Difficulty in achieving intimate adaptation of the composite to the gingival margin resulting in voids. 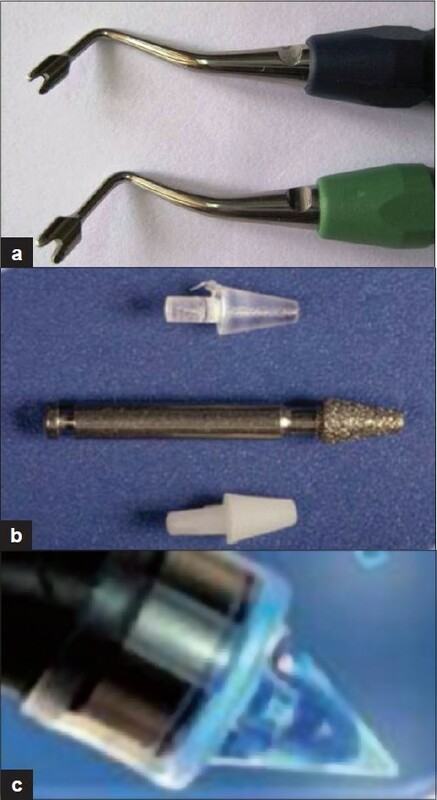 To enhance gingival adaptation of posterior composites, the use of light tips was recommended. These are special plastic tips that fit over most light wands. They help to focus the light closer to the gingival margin thereby improving the curing and adaptation of the composite material [Figure 2]c.
In spite of all these strategies, it was not possible to consistently achieve predictable contacts with posterior composites. This is because amalgam and composites are totally different materials. Amalgam is plastic and condensable while composites are viscoelastic and not amenable to condensation. They also undergo polymerization shrinkage upon curing. The cross-linking of resin monomers into polymers is associated with unconstrained volume shrinkage of 2%--5%. This will create shrinkage at the contact area, decreasing the adaptation and contact pressure to the adjacent tooth. Thus, while a simple Tofflemire matrix and wooden wedge are enough for creating good contacts with amalgam, the same does not work for composites. 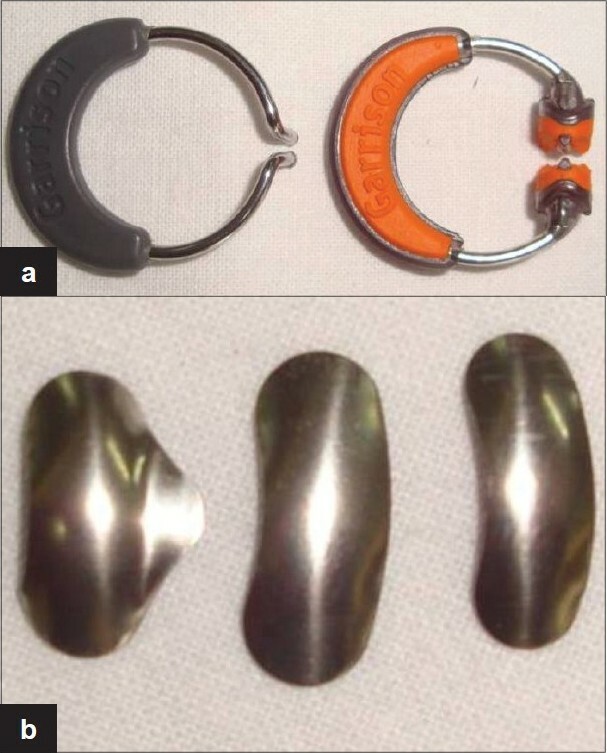 First-generation contact ring systems were introduced in the late 1990s and include the Palodent Bitine (Dentsply) [Figure 3]a, Contact matrix (Danville Materials) and the Composi-Tight (Garrison Dental) [Figure 3]b. Figure 3: (a) Palodent BiTine rings. (b) Composi-tight rings. This was the first system that was available. The rings have rectangular tines which are parallel. They provide optimum separation (0.55 kg/mm). They lack retentive design because of the parallel tines but are easy to place on wide preparations. BiTine II is an elongated ring to allow stacking over the main ring in case of MOD preparations. These rings have rectangular tines which are converging and hence are more retentive. They provide optimum separation (0.38 kg/mm). In this system, a reverse ring is available for MOD preparations. All these systems rely on precontoured sectional dead soft metal matrices that are available in various shapes, thicknesses and sizes depending on the manufacturer. Gingival adaptation of the restoration is good. Ring collapse or displacement in case of wide proximal boxes. Ring stacking that is, placing one ring over the other in case of MOD restoration is a problem. Most importantly, since the contact rings are made of stainless steel, repeated usage and sterilization effects make them lose their springiness over time. To address these deficiencies, second-generation rings have been recently introduced. For example, Composi-Tight 3D soft face ring system (Garrison Dental Solutions) and V3 ring system (Triodent). In the present stage of development, they appear to solve the shortcomings of the earlier rings, but hard clinical evidence is lacking. This has two styles of rings to create the required tooth separation and band adaptation for a tight, natural contact. An assortment of precontoured sectional bands and different sizes of wedges are also available [Figure 4]a-b. The 3D soft face ring is useful in most circumstances. The tines of the ring are covered with silicone to provide good support and contour for the band in wide proximal preparations. The soft face is shaped to mimic the interproximal space between teeth, thus it adapts the band precisely to the tooth contour, eliminating flash [Figure 5]. The slotted bottom fits directly over the wedge. The ring is fully made of Nickel-Titanium which imparts more springiness and longevity than stainless steel. V-shaped plastic tines to accommodate the wedge. The tines have also extra width that enables the ring to contact more tooth structure buccally and lingually providing good contour for the restoration. From being the material of choice for anterior esthetic restorations, composites are now widely accepted as universal restorative materials for both anterior and posterior situations. Developments in composite technology and clinical techniques have facilitated this. While most difficulties encountered with posterior composite restorations have been solved, achieving tight, anatomically correct interproximal contact has been elusive. Understanding the key aspects for proximal integrity is critical to achieve ideal contacts and contours with Class II composite restorations. At present, most criteria for achieving ideal contacts and contours are well met by the use of pre-contoured sectional matrices and contact rings. 1. Dietschi D, Magne P, Holz J. Recent trends in esthetic restorations for posterior teeth. Quintessence Int 1994;25:659-77. 2. Staehle HJ. Minimally invasive restorative treatment. J Adhes Dent 1999;1:267-84. 3. Mjor IA, Moorehead JE, Dahl JE. Selection of restorative materials in permanent teeth in general dental practice. Acta Odontol Scand 1999;57:257-62. 4. El-Badrawy WA, Leung BW, El- Mowafy O, Rubo JH, Rubo MH. Evaluation of proximal contacts of posterior composite restorations with 4 placement techniques. J Can Dent Assoc 2003;69:162-7. 5. Kinoshita S. Colour Atlas of Periodontics. St. Louis: Ishiyaku EuroAmerica; 1985. 6. Eissmann HF. Physiologic design criteria for fixed dental restorations. Dent Clin North Am 1971;15:543-68. 7. Linkow L. Contact areas in natural dentition and fixed prosthodontics. J Prosthet Dent 1962;12:132-7. 8. Strassler HE, Goodman HS. Restoring posterior teeth using an innovative self-priming etchant/adhesive system with a low shrinkage hybrid composite resin. Restorative Q 2002;5:3-8. 9. Barnes DM, Blank DW, Thompson VP, Holson AM, Gingel JC. A 5- and 8- year clinical evaluation of a posterior composite resin. Quintessence Int 1991;22:143-61. 10. Smales RJ. Longevity of cusp-covered amalgams: Survival after 15 years. Oper Dent 1991;16:17-20. 11. Opdam NJ, Bronkhorst EM, Roeters FJ, Loomans BA. A retrospective clinical study on longevity of posterior composite and amalgam restorations. Dent Mater 2007;23:2-8. 12. Kampouropoulos D, Paximada C, Loukidis M, Kakaboura A. The influence of matrix type on the proximal contact in Class II resin composite restorations. Oper Dent 2010;35:454-62. 13. Keogh TP, Bertolotti RL. Creating tight, anatomically correct interproximal contacts. Dent Clin North Am 2001;45:83-102. 14. Lutz F. Improved proximal marginal adaptation of Class II composite resin restorations by use of light reflecting wedges. Quintessence Int 1986;17:659-64. 15. Lopes GC, Ferreira Rde S, Baratieri LN, Vieira LC, Monteiro JS. Direct posterior resin composite restorations: New techniques and clinical possibilities. Case reports. Quintessence Int 2002;33:337-46. 16. Sidelsky H. Resin composite contours. Br Dent J 2010;208:395-401. 17. Bernardo M, Luis H, Martin MD, Leroux BG, Rue T, Leitão J, et al. Survival and reasons for failure of amalgam versus composite resin restorations placed in a randomized clinical trial. J Am Dent Assoc 2007;138:775-83. 19. Gharizadeh N, Moradi K, Haghighizadeh MH. A study of microleakage in Class II composite restorations using four different curing techniques. Oper Dent 2007;32:336-40. 20. Ferracane JL. Using posterior composites appropriately. J Am Dent Assoc 1992;123:53-8. 21. Craig RG, Powers JM. Restorative Dental Materials. 11 th ed. St. Louis, Mo: Mosby; 2002. 22. Leibenberg WH. The proximal precinct in direct composite restorations: Interproximal integrity. Pract Proced Aesthet Dent 2002;14:587-94. 23. Loomans BA, Opdam NJ, Roeters FJ, Bronkhorst EM, Burgersdijk RC, Dörfer CE. A randomized clinical trial on proximal contacts of posterior composites. J Dent 2006;34:292-7. 24. Loomans BA, Opdam NJ, Bronkhorst EM, Roeters FJ, Dörfer CE. A clinical study on interdental separation techniques. Oper Dent 2007;32:207-11. 25. Loomans BA, Opdam NJ, Roeters FJ. Comparison of proximal contacts of Class II resin composite restorations in vitro. Oper Dent 2006;31:680- 5. 26. Kurtzmann GM. Improving proximal contours for direct resin restorations. Dent Today 2010;29:106, 108-9.